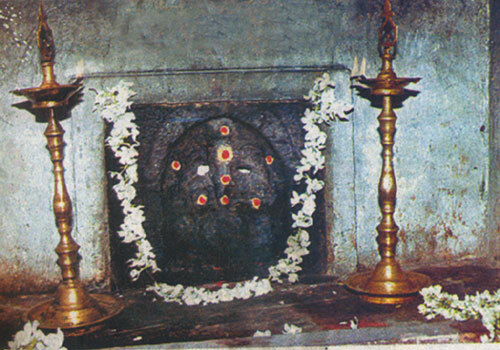 Mahasivarathri in the month of Masi (February-March). Lord Vinayaka, very ancient in terms of time, graces from the shrine of Mother Goddess. Devotees place flowers on His ears with their prayers. If Lord Vinayaka absorbs the flowers into Him, the prayers would be blessingfully responded, is the faith of the devotees. The temple is open from 6.00 a.m. to 11.00 a.m. and 4.00 a.m. to 8.00 a.m.
Sri Puradhana Vaneswarar-Perianayaki Aambal Temple, Pattukottai, Thanjavur district. At a place called Tiruchitrambalam, 15 km from the temple, Yama, the God of Death has his place in a green field area. Mother graces his worshippers with child boon and remedy from illness. Youths are blessed with happy matching, a prosperous and happy wedded life. Devotees perform abishek to Lord and Mother with Vastras – clothing. Lord Vinayaka in the Mother’s shrine has the reputation of devouring the flowers offered by the devotees through His ears, very peculiar in this temple. People place flowers on his ears while submitting their prayers to Him. If the flowers are absorbed by the Lord, the devotee is blessed and his/her ambition would be realized. The tradition is followed even today. The temple is also known as Poovizhungi Vinayaka Temple (Vinayaka devouring flowers) representing this wonder. Lord Shiva wanted to emphasize that a living in forests for sometime also is part of an ideal life. With His consort, He came to this place along with sages and devas – those belonging to the celestial world to this forest region. Lord Shiva went into deep meditation then. He spent a long days in lonely silence-Mouna. The demons, taking advantage of the absence of Lord’s other activities, gathered their strength and became resurgent to trouble the rishis and innocent people. They could be controlled only if Lord opened His eyes. How to wake Him up? Parvathi suggested that Manmadha (cupid) may be asked to send his Passion Arrows (cupid is the power to create love and passion on all beings). Though Cupid was afraid to accept the test against Lord Shiva, for the sake of the world, he obliged by shooting his Passion Arrows on the Lord. As these arrows are made of Flowers, which the cupid used, the place came to be known as Poovanam – Forest of Flowers. Opening His eyes, Lord Shiva turned his look at the direction from where the arrows were shot. Unable to bear the heat emanating from the eyes of Lord, cupid was burnt. This place is called Madanpattavur – place where cupid was burnt. All the Rishis fell at the feet of the Lord and told Him why and how this happened and begged Him for cupid’s life. Milk was spilled to give cupid his life back. This place is called Palatheli – where milk was sprayed on cupid. Representing this episode, people of this place celebrate Cupid Festival – Kaman Pandigai in a place known as Kamankottal. Place: To reach the temple people have to go by bus to Aranthangi from Pattukottai. Those coming from Pudukkottai should come to Aranthangi and proceed to Pattukkottai.